It’s been great watching the rebirth of Games Workshop in the last couple of years. Don’t get me wrong, I think destroying the Old World and replacing it with ‘Age of He-Man Fantasy Space Marines’ was a huge creative misstep and an insult to 40 years of world-building. I still think the company’s pricing policies are offensive, especially when it comes to those of us in the antipodes. But it has been a pleasure to see the company finally do some of the things a lot of us have been saying they should have been doing for years. Specifically, engaging with their customers in an up-to-date fashion, and releasing and revamping good boardgames. 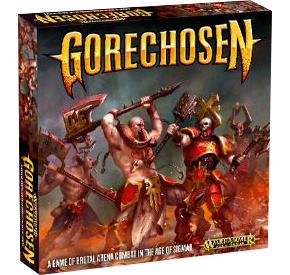 Gorechosen is a perfect example of the new Games Workshop. It’s still overpriced, but it’s self-contained, fun, original and dripping with silly theme. In fact it’s the most self-aware beastie the publically-run behemoth has released for decades: the arena combat theme is completely over the top in a way we haven’t seen since White Dwarf stuck a flexi disc of heavy metal band Sabbat on the cover of issue 95. That’s fun and all, but the game is actually good. It’s even – take a deep breath, this may be a shock – more focused on card play than dice rolls. There are still a lot of dice rolls of course, but you do get to choose an action from the three on each Action card. The gameplay is fast and fun, and even if you do happen to get decapitated early, you can flip your reference card over and roll on a table each turn to mess with your opponents’ turns and enjoy a bit of petty vengeance. The figures are big and detailed and spiky, though the cards could be better quality (make ’em standard sizes for sleeving won’t you GW?). Someone finally dropped the double-barrelled colon-in-the-middle names and came up with something punchy and suitably ridiculous. And finally, there’s one more thing that almost made me have a heart attack … there’s a plastic insert in the box! I don’t believe it! The sky is falling! Things sure are changing over there at GW.